Of the many advances made in flooring technology, there are several superior options that have a lot to offer. Vinyl is an extremely versatile material that can be formed into virtually anything and is inexpensive to make. Vinyl plank flooring features a very convincing real wood look in planks that offer all the aesthetics of a beautiful hardwood floor but with the practical benefits of vinyl. For the highest quality vinyl plank flooring on the market. We strive to offer the widest selection of superior grade vinyl plank flooring available to homeowners. We work with the finest manufacturers, so you always get the best on the market no matter what. Our install technicians are also professionally trained and possess the experience and tools necessary to quickly and effectively install your vinyl plank flooring. We are dedicated to superior workmanship and unmatched customer service and it shows in every job we do. That is why we are the top choice for vinyl plank floors. The major appeal to vinyl planking is that it looks convincingly enough like hardwood (which is the standard for nice flooring) but it is significantly less expensive. Vinyl is fairly durable as it can take a bit more abuse than real wood but its biggest practical advantage lies in its moisture resistance. Vinyl planks are waterproof, which can often mean they will last longer than most other floor types. Moisture tends to warp and pull apart almost any floor type over time, but it won’t have an effect on your vinyl planks. 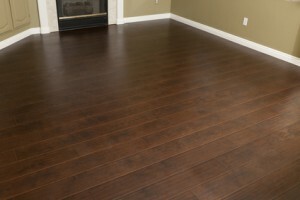 When you explore flooring choices, consider vinyl planking as a fantastic option. Our designers will show you the finishes and stain styles we have available and discover the best vinyl planks for your space. We offer expert installation performed with precision by skilled specialists and we get the job done right the first time. If you are looking for an inexpensive way to totally transform your home, vinyl planks can do the trick.